For years now, companies and individuals around the world have developed ideas and concepts that, at times, have revolutionized the world, an industry or society on how we do things through some type of product, service or technology. Sometimes we hear about these innovative breakthroughs, and more times than others we may not even be aware of them. The origins and roots of those great ideas are based on need, desire, hunger, understanding and creative thinking. I call it the “What If Factor”. It’s that insatiable drive to make things better, to solve something or to fulfill a specific need. You most likely have heard the saying “Necessity is the mother of invention.” Well, that seems to be a universal dynamic and we should all be thankful that it continues to drive humanity to adapt, change and create a better world. Before I share how you too can use that desire and drive to help you make great strides in your business, in your income and in your life, I want to give you some recognizable examples that will explain the impact of having that type of “Mind-set”. For example, look at what happened when someone at McDonalds thought “What if we offered breakfast all day long?” At Hotels… What if we served a Free Breakfast to all guests in the morning? With Airlines… What if we offered points & frequent flyer miles to passengers? At Disney Resorts… What if we gave away park tickets in exchange for guests taking a vacation timeshare tour? With Credit Cards… What if we gave cash back or rewards with every purchase? At Starbucks… What if we made it easy and hip to drink coffee? At Subway… What if we marketed our sandwiches with a $5 Dollar Foot Long slogan? With Facebook… What if we created a way to connect with potential dates, friends and family via the internet? At Apple… What if we made portable music, laptops and cell phones easy, convenient and stylish to use in our daily life. And on and on with so many similar stories like Amazon, Coke, HSN, As Seen on TV, etc. Simple creative ideas to market themselves that generated billions of dollars in sales. They also all made sense to millions of people so it worked! In 1995 I had my own “What If” moment and a revelation in the marketing industry in which I live, sleep, dream, eat and breath. It actually changed my life and eventually the life of over 120 employees. I found and discovered a way to get advisors and estate planning attorneys in front of motivated prospects that were interested in investing in retirement, managing their estate planning and protecting their life savings, but were too afraid, confused and skeptical about turning their money over to someone to manage it. Retirement was imminent but they held back and procrastinated as to when they would take action and decide to meet with someone. To break down those barriers, I pondered on what I could do from a marketing perspective to solve that huge emotional decision that millions of couples were going through in order to finally seek financial guidance and advice. 22 years ago, my moment came!! “What if” I developed a way to get advisors and those concerned seniors to meet somewhere in the middle, at a neutral, safe and comfortable place that they were familiar with? What would happen? Well, it worked and boy did it ever work. My first attempt was to send 5,000 personal invitations by mail to a targeted audience within 15 miles of the advisor’s office… by zip code, age, income, homeowner status and investable producing assets of $200,000 and up. I chose a restaurant as the comfortable nonthreatening meeting place, and why not serve dinner after the presentation as a courtesy and to have time to mingle and meet with folks. In my first attempt ever, days after the mail hit their homes, 267 people called-in to attend my client’s social event and presentation. You and your industry call them seminars. After 579,000 of those dinner events, I had duplicated what many others mentioned above had done to create a solution that eventually would change the way advisors would market themselves all over the country. The concept would also make so much sense to consumers that it would generate over $300 million in 22 years for my little company out of Tampa, Florida. On the advisor and estate planning attorney side, that humble and simple “what if” idea caused billions of dollars to exchange hands between pre-retirees and thousands of agents in this country. It dramatically changed things and made for an unbelievable American dream success story. 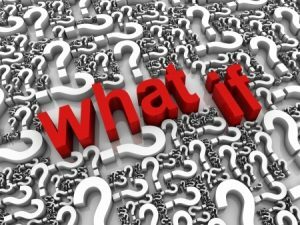 I wrote this article and shared this personal journey of mine to get you to think… what could be your “What If” idea to dramatically grow your business? What can you do that would propel your practice to another level? What would differentiate you? What can you solve? It happened to me because I had the hunger, desire and relentless drive to be someone in life and make a difference. Do you have that? Many of us came from humble beginnings so it’s possible that you already have that in your DNA. So now it’s your turn. “What if” you started to think that way today? What could happen in your life and your business in the next 2 to 3 years? Please give it some thought. I wish you the same fortune, aspirations, and imagination that I had when I went through that incredible experience. It was (and still is) a phenomenal journey for me, bringing happiness, fulfillment and more importantly, a true meaning to what I was doing in life. Believe in that “What If” factor. It can be very powerful for you, your family and for thousands of individuals waiting for a better way… hey, maybe even millions.